Nitrome Must Die is a new action packed platformer shooting game from the amazing nitrome. Your objective in this game is to infiltrate the nitrome towers, the place where nitromians produce awesomeness. You just don't appreciate what they are doing so you had enough and wants to end their awesomeness once and for all. I will not lie, this is no doubt one amazing game. The nitromish art and graphics, the animation and gameplay are just awesome. The levels are group to a set of ten and every time you replay a specific set you might get a different gameplay because there more than 10 levels in each of them which makes the gameplay less repititive. There is also a boss battle at the end of each 10 level set that you must beat in order to proceed. 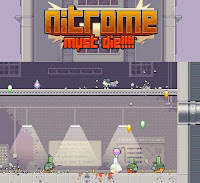 Meanwhile, here is NMDw Nitrome Must Die walkthrough from a nitromegamer showing game guide on beating the bosses.